Perhaps you’ve been feeling unsettled and uncertain, even a little lost. You know you need to do “something” but you’re not quite sure what. You might feel the need to take a different direction, but question which way to go. Maybe you’re even feeling a bit powerless in your life and you want to replace that confusion with peace and joy. If so, I understand that completely. It’s so easy these days to lose our true selves in the hustle and bustle and often we find ourselves, our needs, and our desires coming in last on our to-do lists. We give away our power to everything and everyone in our lives, except for ourselves, leaving us feeling tired and anxious. My purpose is to empower you, by helping you see the choices available to you and by creating strong magical tools that are available for you to manifest your intentions with passion. I’m here to help you release draining energetic connections, call back your power and begin to heal on an energetic level so you can move on to healing emotionally, mentally and physically. 2019 Year Ahead Reading - limited time only! If you are looking to gain insight about specific questions, or to know what the future holds for you in different areas of your life, such as career, finances or love life, this is the session for you. With the help of a traditional tarot reading, intuitive messages, spiritual "downloads," and sometimes, messages from loved ones on the other side, I dive deep into the areas of your life you've been questioning. Answers are straight-forward, but always delivered with love and compassion. My sessions offers you the insight you need to move forward, while allowing you the freedom to make the best choices for yourself based on the spiritual guidance you receive. Sessions take place by video or phone using ZOOM and are recorded so you will have a copy. Whether you are looking to begin a meditation practice or to learn more about what help you need to balance your chakras, this package is right for you. I connect and read your energy at a very high vibrational level, which allows me to identify where you might have blockages or deficiencies that would benefit from more support. I then take that downloaded information and create a beautiful custom Mala for you to wear or to use in your meditation practice (or both!). This Mala can be used to activate and strengthen your Chakras and help bring about balance and peace in your life. I will provide you with an outline of my notes taken during my reading via email. The mala will be delivered via USPS Priority mail and I will provide you with a tracking number. When you also select the healing, I will meditate and connect to your Spirit Guides and mine, allowing me to send you powerful Source energy to balance and heal your chakras. Create energetic assistance for your manifesting efforts with a custom spell. You begin with a 30 minute session to discuss what issues you are having (love, money, confidence, need for protection, legal work, redirecting your focus), just about anything you can think of can be made into a spell. Kim will the craft the perfect spell and send you a kit along with instructions and the perfect timing. OR you have the option to have Kim cast the spell for you. The number one rule in magick is that you believe. I believe in you and want for you to feel empowered by working magick. NOTE: While results are often fabulous and people have great success stories, success isn’t 100% guaranteed. You are not paying for results, but expertise, time and supplies. Start a regular mindfulness practice now. Wonderful! 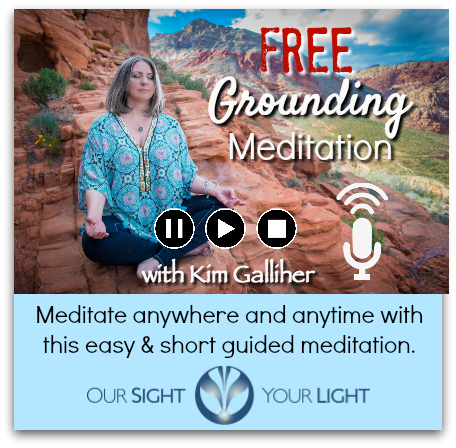 Now keep an eye on your email to download your guided meditation.